Known as a popular skin care brand, which has been around since 1964, Thalgo recently partnered with one of our favourite chain of salons - Jean Claude Biguine. The collaboration presents an exclusive range of facials and rituals, which aims at detoxfying, hydrating and soothing your skin from within. 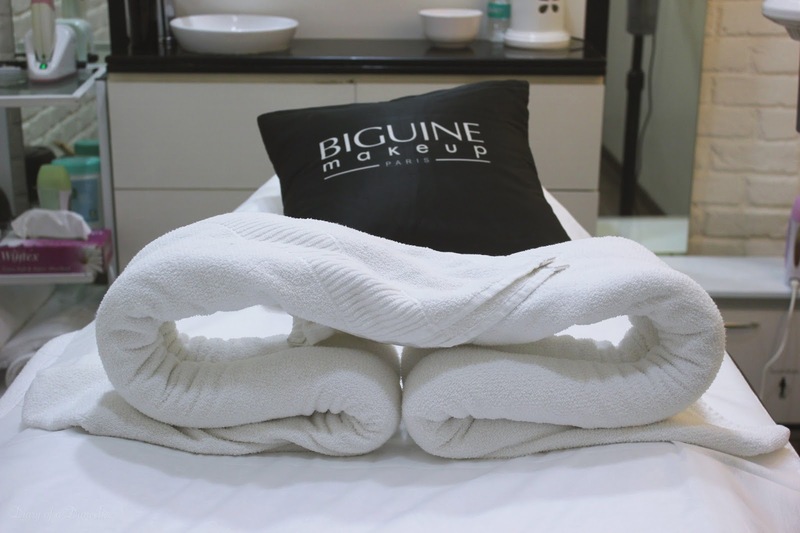 Each skin service is designed keeping in mind different age groups, skin types and concerns, which is perfect, because the wrong facial can often damage your skin on a long term basis. 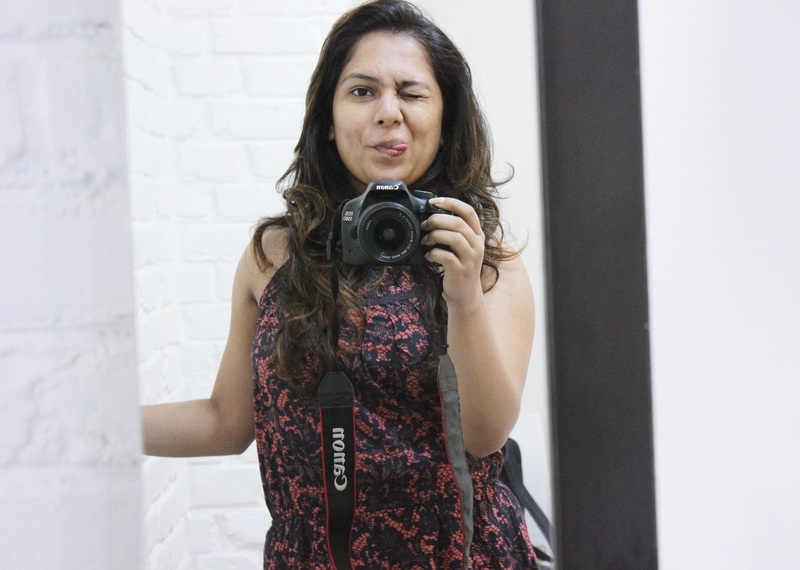 I was invited to experience any one of their Thalgo skin services and since I had a day packed with meetings in and around Lower Parel, I picked the Palladium JCB branch and opted for an evening slot, so that I could head back home early and chill (before getting ready for another super long day). Read on to know my experience, the ritual chosen for me and our final verdict on the facial menu. After a warm welcome, the JCB treatment specialist - Juliet, took me to the treatment room, where after a quick chat about my daily routine and lifestyle, Juliet analysed my skin, to understand the main concerns. Since I have never got a facial done (Yes! Never, and I don't think I will opt for it anytime soon), Juliet further discussed my skincare routine and came to the conclusion that a ritual would be better than a facial, since my skin is too young and the main concern is only hydration (I have normal - dry skin, which is extremely sensitive). Juliet suggested that we opt for the Source Marine Ritual (details given below), an hour long treatment that helps soothe and hydrate the skin from within. After a quick change, the lights were dimmed and with an ocean themed track playing in the background, I was ready to get transported to a wonderful world of virgin beaches, islands and a vast ocean. Ritual: Thalgo Source Marine - deep hydrating and replenishing treatment, the result is a healthy glow by creating a well of vital water in the deeper layers of your skin. Experience: The first step of the ritual was to tie a the towel into a turban around my head. After cleansing and thoroughly cleaning my face, the therapist created ocean wave like movements using her hand and kept moving it next to my ears, in order to ensure that I relax my body, mind and soul. The turban ensured that I hear nothing but the ocean waves. 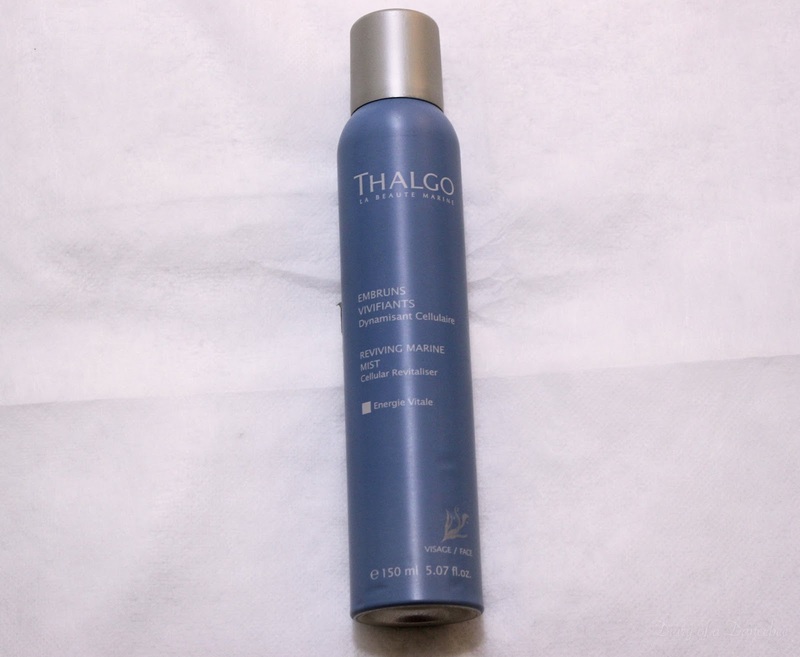 After a few minutes, the Thalgo reviving marine mist (my favourite product from the entire ritual) was gently sprayed all over my face, neck and shoulders. A few minutes of gentle massage and ocean wave movements were followed by the usual steps of a clean up - exfoliate, steam and removal of blackheads. Keeping my sensitive skin type in mind, the scrub used for the procedure wasn't harsh and the micro beads gently did its job. What followed the exfoliation process was another round of mild cleansing, and then a fantastic dry massage (that almost put me off to sleep). Once again, the mist was sprayed and after drying my face with a tissue, the therapist prepared the marine mask. A thick layer of the mask (the fragrance of which made me feel like I am scuba diving at a virgin beach of Konkan and being the water baby that i am) was gently and generously applied all over my face and neck. While the face mask did its job, the therapist again continued the ocean wave - like movements. A few minutes later, the mask was peeled off and after a final round of cleansing, the mist was sprayed once again. The therapist advised that I must not follow up with any moisturiser, and keep the skin free from any product for the next 10 - 12 hours. While treating myself to a cup of lemon tea after the ritual, I noticed how my skin felt hydrated and relaxed, just like it would after a good vacation. What does it promise? 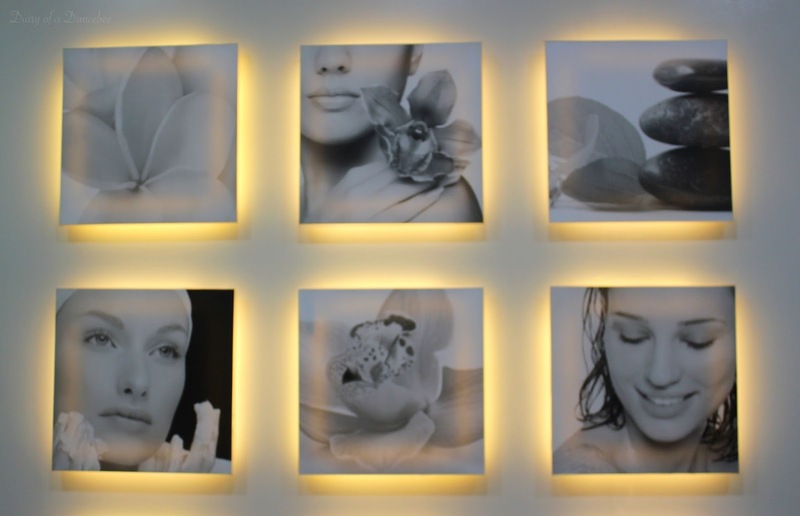 - Restore your radiance and reveal younger-looking skin with customised facials. Jean-Claude Biguine will offer treatments by French beauty brand Thalgo (www.thalgo.in), using its marine-based skincare and body-care products. Thalgo is also an exclusive brand partner at Jean-Claude Biguine for the facial menu, which is divided into three distinct categories: Essential, Exquisite and Anti-Ageing. In addition to the Thalgo facials above, JCB will also offer unique Thalgo Eye Treatments to minimize all signs of fatigue, strain and ageing (additional charges apply). The treatments range from around 30 - 75 minutes and cater to specific age, skin type and concerns. Services available - Essential: Instant Radiance Facial, Aquarelle Regenerating Facial, Source Marine Ritual, Pure Freshness Ritual | Exquisite: Brightening Rejuvenating Treatment | Anti - Ageing: Collagen Smooth Treatment, Silicium Super Life Treatment | Facial Add-on: Collagen Velvet Eye Expert. Verdict: I was very happy with the ritual. It left me feeling lighter and my skin got enough hydration before the winter spell in Mumbai. It's like a mini vacation for your skin packed into an hour long ritual. The prices may look a bit on the expensive side, but your skin is a precious gift and these rituals are worth every penny that you spend. After all, every good thing that you do for your body is an investment. If you are looking to de-stress anytime soon, or if adding a healthy glow to your skin tops your priority, then you must give this range a try. Worth your money and time!